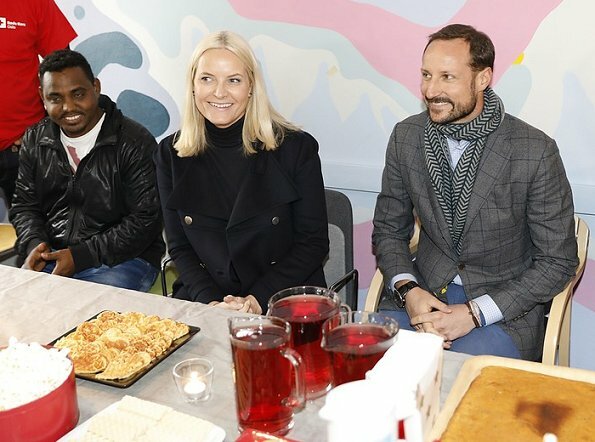 On February 15, 2017, Crown Prince Haakon and Crown Princess Mette-Marit of Norway visited Torshov Refugee Reception Centre (Torshov transittmottak) in Oslo, Norway. The Torshov Refugee Reception Centre in Oslo is a transit center for refugees and asylum seekers run by the Norwegian People’s Aid. Love picture 2 of MM, she looks very cute. Very nice coat. She looks good. Yes she does. I love the jacket. The cost is very nice and I think Metter is dressed very appropriately for the occasion. Haakon is good looking as usual. the woman in the last picture is a very very beautiful lady! MM looks lovely here, she has a beautiful face. I like her in sporty style, she looks well here. Muy adecuada esta ropa casual para esta visita. Mette-Marit se ve guapa, mejor que Haakon.